Three Chinese astronauts are currently visiting China's Tiangong 1 space lab in orbit on the country's fifth manned mission to space. The flight, which has been going smoothly so far, officials say, is a step toward the country's long-term plan to build and operate a larger space station in the future. The three-astronaut team of the Shenzhou 10 mission — Nie Haisheng, Zhang Xiaoguang and Wang Yaping — closely monitored their spacecraft's automatic docking process with Tiangong 1 on Thursday (June 13), reporting back to ground control the status of the auto-navigation control mode link-up. While onboard Tiangong 1, the Chinese astronauts are slated to conduct space medicine experiments, technology experiments, as well as broadcast a lecture to Earth-bound primary and middle-school students about the physics of microgravity. "We are all students in facing the vast universe," Wang said prior to the liftoff, according to Agence-France Presse. "We are looking forward to joining our young friends to learn and explore the mystical and beautiful universe." Segment of Long March 2F booster fairing found after launch. The docking between the Shenzhou 10 and Tiangong 1 vehicles was the fifth docking between Shenzhou-type spacecraft and the target module. Previous dockings included two automated operations by the unpiloted Shenzhou 8 in 2011 and both an automated and manual docking by the piloted Shenzhou 9 mission last year. "The docking appears to have occurred exactly on time," said Bob Christy of the Zarya.info website, and was within one minute of that website's prelaunch estimate based on the earlier Shenzhou 8 and Shenzhou 9 missions. Christy noted that a diagram on a video screen in the Beijing Aerospace Command and Control Center showed Tiangong with its docking unit pointing backward. It also showed that Shenzhou 10 used an independent elliptical orbit that caused it to approach Tiangong 1 from below before falling in behind it to dock. For the two previous missions, Shenzhou first matched its orbit with Tiangong and then closed the gap slowly in order to dock, Christy told SPACE.com. 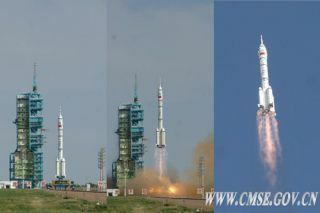 Shenzhou 10 launched June 11 atop a Chinese Long March 2F rocket from the Jiuquan Satellite Launch Center in the Gobi desert. Pieces of Shenzhou 10's escape tower recovered in China’s Inner Mongolia. The Tiangong 1 target module has been circling Earth since September 2011. According to Chinese media outlets, that module is to remain in service for another three months. "It has to move up or it will re-enter naturally in a small number of weeks," Christy said. According to news reports, Tiangong 1 is to be de-orbited, or destroyed by letting it fall through Earth's atmosphere, said Dean Cheng, a research fellow on Chinese political and security affairs at the Heritage Foundation in Washington, D.C.
"Why? Even if it was only an initial prototype," Cheng said, "what is wrong with the vehicle — or what has been exhausted — that they feel the need to de-orbit, rather than use it as a stepping stone?" Some China space watchers have predicted the development of a Tiangong 2 module, an improved design that would feature an orbital fueling capability, gassed up by a cargo vehicle. That space lab module may be outfitted by a robotic arm system, appraised in space and later adapted to assist in fabricating a larger space station in the 2020 time period. Cheng told SPACE.com that the Shenzhou 10 mission likely marks "the end of the beginning," a crowning achievement for the Shenzhou program, marking a decade of piloted Chinese missions. "This is not the end, however. Like [the U.S.] Mercury or Gemini programs — really, the two rolled together — this phase has been an opportunity to test technologies, provide training opportunities, and garner invaluable data for the main goal — Project 863-205 — a Chinese space station," Cheng said. However, less clear, Cheng said, is what missions the Chinese will undertake between now and when they orbit the space station. "I suspect the long pole in the tent is the Long March 5 vehicle, which Western press reports suggest is running into difficulties," Cheng said. "If they cannot get that to operational capability, can they meet the 2020 deadline?" One interesting side story to the launch of Shenzhou 10 were reports by Chinese news outlets regarding Long March 2F leftovers that fell to the ground. Fragments of the booster's nose cone shroud and black boxes were found near the city of Yulin in Shaanxi Province, Northern China. Segments of the fairing (the part of the rocket that covers the payload) dropped into a precalculated area in which ground search teams were at the ready to pick up the components. Pieces of Shenzhou 10's escape tower also were recovered in China's Inner Mongolia.